Browser maker Opera, which has only a small fraction of the market but is trying to boost its position in the mobile area through innovation, has released new versions of it mobile app for the Android, Symbian and iOS platforms. Opera has been ambitious in a crowded industry. Last December, it purchased two mobile advertising companies, Mobile Theory and 4th Screen Advertising, to improve its position in the U.S. and European mobile advertising markets. Since its arrival on the browser scene in 1994, Opera has introduced innovations that browser users take for granted today, such as tabs, the integrated search bar and pop-up blocking. It also introduced server-side web page compression, a controversial feature later incorporated into Silk, the web browser found on the Amazon Kindle Fire. Many of the improvements in Opera Mobile 12 for Android and Symbian are the kind of "under the hood" improvements that don't spark technolust in consumers. But they are still worth a peek. A new HTML5 parser has been added to Mobile 12. With it, the browser will support web apps and improve the browser's compatibility. In addition, the browser supports orientation. When you move a device, the browser responds to the change in spatial position, as when you change from portrait to landscape mode. It also supports CSS3 radial gradients, which should improve how some web pages look in the browser, and cross-origin resource sharing, which should better the performance of some apps. Improvements found only by the Android version of the browser are the addition of WebGL, for support of 3D in the software, and the ability to use a phone's camera from within the browser. 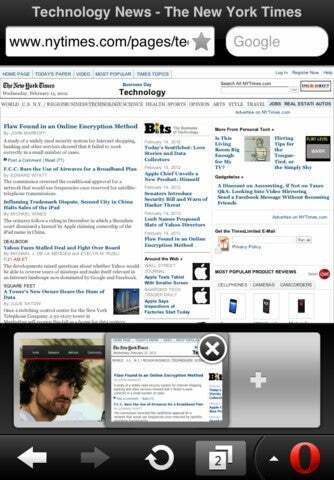 Opera's browser for Apple mobile products, Mini 7, also received some performance enhancements. The company claims it's six times faster than previous versions and performs especially well when connecting to slower, crowded networks. In addition, Mini 7 can compress 90 percent of its data traffic, which contributes to its perky performance. Opera has also added to Mini 7 "Speed Dial." It's like the buttons on a car radio, but instead of jumping to your favorite radio stations, it lets you jump to your favorite bookmarks. Visual tabs have been added to the Mini 7, too, as well as a feature for syncing speed dial settings and bookmarks with Opera on the desktop or other devices. Opera Mobile 12 is available from the Android Market and Apple App store. As Apple does with third-party browsers offered by its app store, Mini 7 comes with a warning that you must be at least 17 years old to download the app.